Something both delicious and nutritious is often hard to come by. 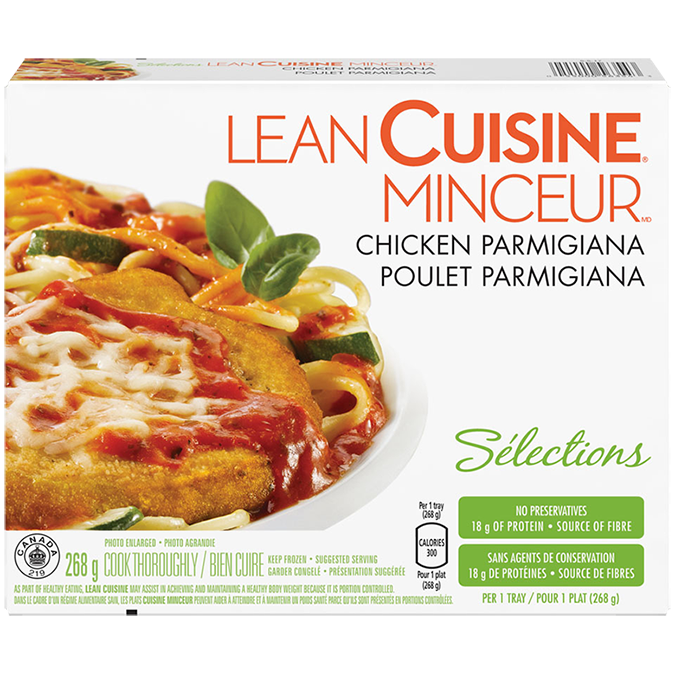 LEAN CUISINE® Chicken Parmigiana is a delectable exception. Enjoy tender pieces of white meat chicken topped with mozzarella and parmesan cheese, and a zesty tomato sauce. Yes, you may tell people you’ve made it yourself. 1. Preheat oven to 350°F (180°C) maximum. 2. Pierce film. Place tray on baking sheet on centre rack of oven. 3. Bake 35 min. Stir pasta; re-cover. Continue cooking 10 min. Let stand 2 min. 2. Cook on high 4 min. Stir pasta; re-cover. Continue cooking on high 2 min. 3. Let stand 2 min. For food safety and quality, follow these cooking instructions: Cook to a minimum internal temperature of 160°F (71°C). Since appliances vary, cooking times may need adjustment. Do not prepare in toaster oven. Do not reuse tray.